Markets are down small after some disappointing consumption data this morning. Bonds are taking a breather and are down small. Personal Incomes rose .3% in April, while spending fell .1%. Inflation remains in check. The income number was in line with Street expectations, while the spending number was not. March’s spending number was revised upward from .9% to 1.0%. University of Michigan Consumer Confidence ticked up slightly to 81.9, although it came in lower than expectations. The ISM Milwaukee report leaped to 63.5 from 47.3 a month ago, while the Chicago Purchasing Manager’s Index increased from 63 to 65.5. These numbers beat expectations handily. April has had some very divergent economic indicators, with the weak industrial data points to some of these other strong indicators. 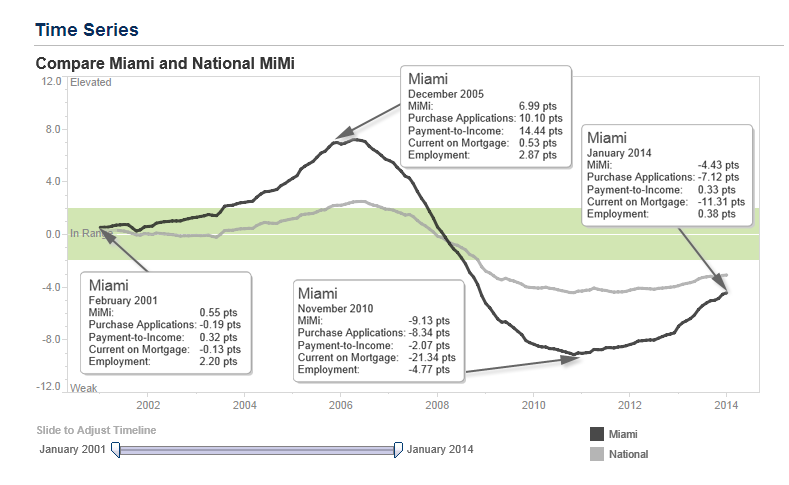 Refis dropped to 37% of all closed loans in April, according to Ellie Mae. Average FICOs ticked up a point to 726. Average days to close a loan fell to 39. With rates falling over the past month or two, where are we going to get a wave of refis? The conventional wisdom is 4% mortgage rates. Remember, however the concept of prepayment burnout, which means that each successive dip in rates has less of an effect on refinance activity, mainly because the pool of people with a refinancable mortgage shrinks. That said, home price appreciation is counteracting that effect as people who were underwater last year and unable to refinance are able to take advantage of it this time around. More speculation on what is going on in the bond market. Interestingly, according to Commitment of Traders data, speccies are increasing short exposure – the bears are fading the rally, not capitulating. Interestingly, the Fed’s balance sheet actually shrunk over the past week – not by a lot – but still it is surprising. At the end of the day, absent some sort of valid technical explanation of the strength, you have to believe the stock market is telling you one thing and the bond market is telling you another. Markets are higher after some mixed economic data. Bonds and MBS continue their rally. First quarter GDP was revised downward to -1% (the Street was at -.5%). Obviously the Street is happy to accept the weather excuse and give the market a mulligan. Personal consumption rose 3.1%, and initial jobless claims fell to 300k. Pending Home Sales increased .4% month-over-month, but fell 9.4% year, over year. They rose .5% in the Northeast, 4.7% in the Midwest, fell .7% in the South and fell 2.6% in the West. 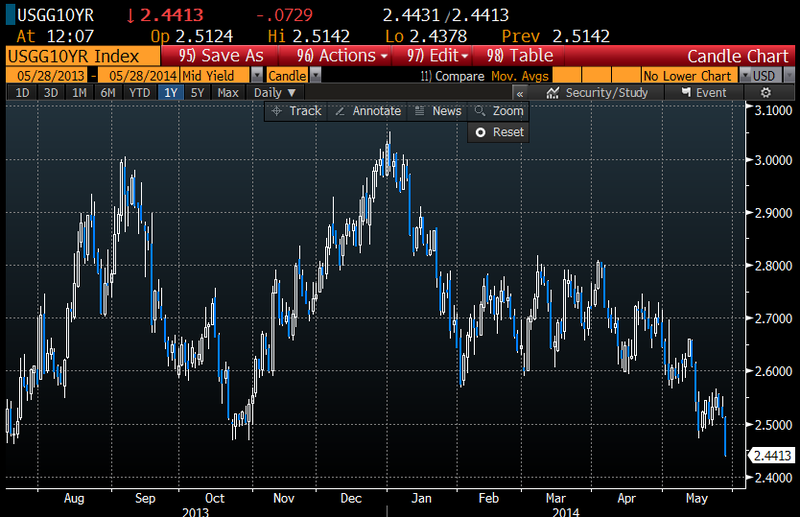 What is going on with bond yields? The economic data has been “meh,” not weak, so why are we below 2.45%? Not sure, most explanations feel like justifications, not reasons. It could be nothing, but keep in the back of your mind that the bond market is telling you something, and you’ll find out the reason for the strength later on. For LOs, this is a good time to wake up borrowers that missed out on refinancing last fall, or buyers who were hoping for a better rate. There were 48,000 completed foreclosures in March 2014, up 5.9% month-over-month but down 10% year-over-year, according to CoreLogic. Approximately 720,000 homes in the U.S. are in some state of foreclosure, compared to 1.1 million a year ago. 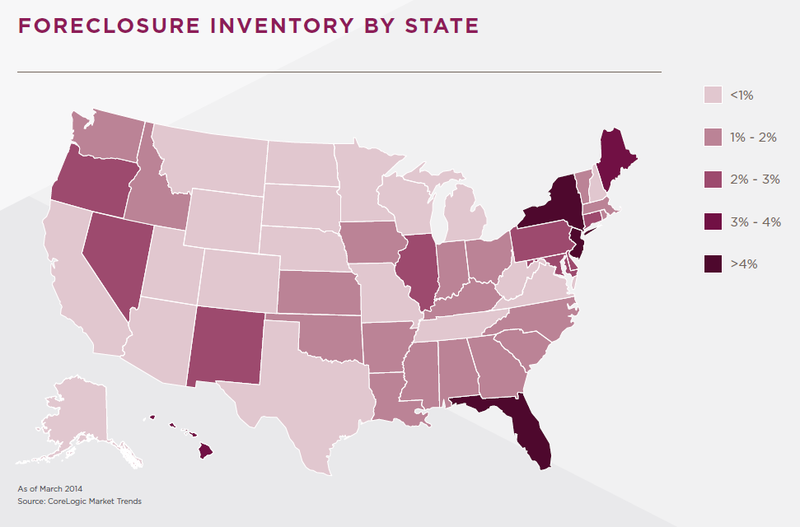 The foreclosure inventory is largely concentrated in the judicial states of Florida, New York and New Jersey. Over the past year, the number of seriously delinquent homes fell from 2.33 million to 1.86 million. Markets are flattish on no real news. Bonds continue their rally, with the 10-year bond trading at 2.47%. MBS are up as well. Mortgage Applications fell 1.2% last week, as purchases fell 1.1% and refis fell 1.4%. The 10 year bond yield fell a basis point over the week. Refis were 52% of all loans, and ARMs are now 18.5% of the total dollar amount of loans (though only 8.4% of units, so these are mainly jumbos). Obama has nominated San Antonio Mayor Julian Castro to lead HUD. This is more or less a political appointment, as Castro is viewed as a rising star in the Democratic Party. His confirmation in the Senate should be smooth, and the nomination should not imply any major policy changes out of HUD. Homebuilder Toll Brothers reported second quarter numbers this morning, and it looks like things are still going swimmingly on the luxury end of things. Revenues rose 53% as deliveries increased 67% in dollar terms and 36% in unit terms. Remember, Toll Brother bought Shapell Homes, so these aren’t necessarily apples-to-apples comparisons. ASPs increased 22% (!) on a year-over-year basis to $706,000. Shapell’s footprint is affluent Coastal California, so that accounts for some of the big jump in ASPs – most other builders are reporting increases in the 9% – 12% range. That said, the Fed is still worried about housing, as the sector continues to grow as expected. Unfortunately, the Fed doesn’t have a lot of levers to deal with the underlying issues: low household formation and tight credit. Again, all real estate is local, and the problems are mainly in the Northeast, which is still dealing with a large shadow inventory of foreclosures. In areas where this has been dealt with already (California), there is a tremendous amount of building. Markets are higher this morning after some good economic data. Bonds are surprisingly up. Durable Goods orders rose .8% in April and March was revised upward from 2.6% to 3.6%. The Street was looking for a drop of .7%. That said, ex-defense orders were down .8%. Ex-transportation, durable goods orders were up .1%. In other data, the Markit Purchasing Managers Index came in at 58.6, a strong number. Consumer Confidence rose to 83 in May, and the Richmond Fed Manufacturing Index was flat at 7. I think we got more economic data this morning than we got all of last week. We have a couple of real estate indices this morning as well. The first is the FHFA Home Price Index, which rose .7% in March. According to FHFA, prices are back to July 2015 levels and we are within about 6% of the previous peak. We have a tremendous dispersion of strength between regions, where the Pacific division is up 18% over the past 5 years, while New England is down a couple of percent. The Case-Shiller index rose 1.24% for March. Prices are back to mid-2004 levels, according to the index, and are still about 20% off their peak in 2006. So, according to FHFA, we are within 6% of the peak and prices are at mid 2005 levels and according to Case-Shiller, we are within 20% of the peak and prices are at mid 2004 levels. Who is right? The answer is both. Case-Shiller is a broad-based index, while FHFA is narrower. The FHFA index only looks at homes with a conforming mortgage, which means it excludes jumbos and cash sales, which have been historically distressed properties, although that is changing. Always-thoughtful Gary Shilling talks about how a financial crisis in China could be the catalyst for a massive “risk-off” trade, which would mean the rally in bonds could last longer than people think. Note that mortgage REITs (one of the biggest investors in mortgage backed securities) are leaning that way.